Several of my family members are huge Tres Leches Cake fans. What is not to love about a variety of creamy milks combining together and soaking and saturating each and every bite?! 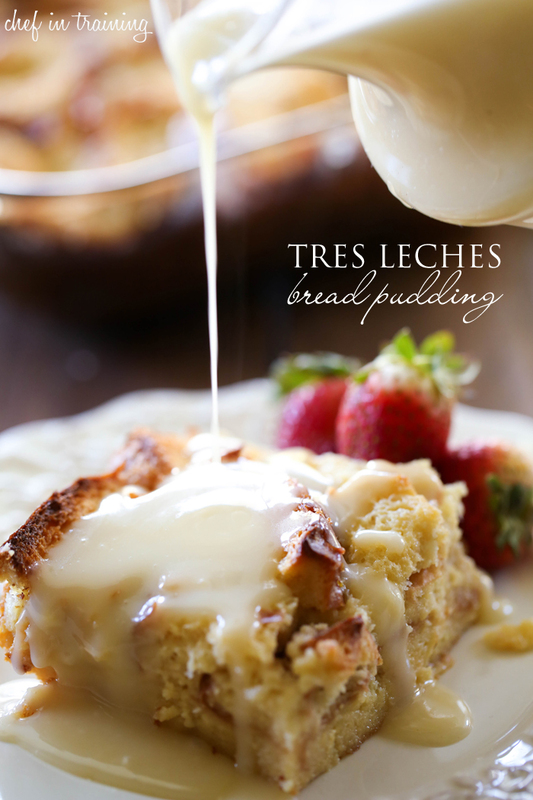 This Tres Leches Bread Pudding is a dessert or breakfast that will wow your company. It is SO simple to throw together but tastes so fancy and special! It is absolutely perfect for the holidays! The layers of bread just melt in your mouth. It is heaven with each and ever bite. That said, the real magic of this recipe is found in the Vanilla Cream Sauce. Oh. My. Gosh. It is to die for! I could drink this stuff…. I wish I were kidding! The Vanilla Cream Sauce and bread pudding combine together to bring you melt-in-your-mouth amazingness! Don’t miss out on this recipe! This is a dream of a recipe. I cannot wait to try it. Oh man, does that ever look good. I have a weakness for bread pudding. HI. ! Can you make this ahead of time and keep it in the refridge and then just warm it up again in the oven the day of the party? Cut the vanilla sauce in half and it should be just enough. Recipe makes way too much sauce. HO. MAI. GOD. Sooo so good. Made this for brunch and it was a hit! People who are worried abt calories can STFU and move along. (Excuse my French!) I have such strong feelings for this bread pudding! I would suggest that u lean the bread slice halves kinda 45 degrees against the side of the pan. And keep arranging the whole bread that way and pack it somewhat tight. This way when u pour the egg mixture it doesnt cover all the bread, leaving the tops exposed to allow them to get crunchy! The crunch with the moist pudding is perfection. Also, do not prepare this overnight and let the bread soak in the egg mixture so u can pop this in the oven in the morning. Just prepare it in the morning. It takes no time at all. You do not want your pudding to be soggy. I keep my baked bread pudding in the warm oven until i'm ready to serve, and then I pour the sauce over it. Thank you so much for this recipe, and I hope everyone else will enjoy it too! my husband loves bread pudding ,i need a new recipe . This recipe looks absolutely amazing! I have to try it. By "evaporated milk" do you mean powdered milk? I'm thinking of making this as dessert and adding/sprinkling sliced almonds on top. Evaporated milk comes in a can just like the sweetened condensed milk does. They are usually next to each other in the baking aisle. The best brands are Carnation and Eagle. Powered milk is totally different. No, canned milk. Skip it and use cream. You won't have the metallic taste of canned milk. I made this for my bookclub dessert. Sooooooooooo not impressed. I would call this mediocre. The vanilla sauce was very good, but only make half the recipe as it makes way too much. There are too many other GREAT bread pudding recipes out there, find another one. I made this for my boyfriend who loves bread pudding and he LOVED it! I brought the rest to work and everyone here is loving it too and asking for the recipe! I cooked it 40 minutes and wish I had cooked it a tad longer. I also used Challah bread instead. How much white or dark rum should put in the sauce for flavor? I'm leaving the extract out of the pudding, but I'd like to add s littlr in the sauce. Thoughts ? i love the recipe. But we did not finish it. Can we keep the leftover? Do I assume I need to refridigate ? My children are lactose intolerant what can I use instead of a can of condensed milk & a can of evaporated milk ,could I use oatly cream or coconut cream instead as I would love to try this recipe . In Brazil we make tres leches with condensed milk, heavy cream, and coconut milk. Get your kids some Lactaid - lactase enzyme supplement. I'm lactose intolerant too, so I take Lactaid so I don't have to sleep in the bathroom after consuming dairy. I could touch myself just thinking about this! I made it yesterday and it turned out just glorious. Don't worry about there being too much vanilla sauce, whatever's left you'll just wanna drink afterwards! I'd become the personal servant of the woman who created this if I could! Warm, moist, lovely, and delicious. This is ridiculously good. The sauce makes it. Yes, you certainly do want to drink it. Just made this tonight. Family loves it! WIN! Only half the sauce, though I could probably eat it alone. I've made this so many times, its amazing! "m making this for my bunco group coming up. It really is dreamy! Most desserts in our house last a couple days at least, but this one disappeared in hours. My son loves bread pudding and Tres Leches cake so I had to try this. He loved it, said it's his new favorite dessert! In fact my whole family loved it. The only changes I made were adding cinnamon to the custard because it's traditionally in a Tres Leches cake, and I halved the Vanilla Cream Sauce recipe as others had suggested. I thought about adding rum to the sauce too, but it was perfect without it. I will definitely make it again. Thanks! I expecting to do this delicious recipe. Good for breakfast, not so early, approximate at 10:00.Or like a dessert. When I see you in Facebook, I thought, this is the right opportunity for me, to learn something new about baking and cooking. I cook but I need to do something more, different, try different flavors. I'm sure you'll be my Chef, my teacher. Thank you, Niki. I made this tonight for a Cinco de Mayo gathering at my house and it was a HUGE hit! Talk about delicious. That cream sauce is everything. And it was so easy to make. Thanks for sharing! I don't really care for rum extract but would rather use rum. Can you sub it out in this recipe and if so, thoughts? That was fabulous. I normally just eat one serving of fresh made bread pudding, when it hot and fresh and then that is all I want. I made this bread pudding, and IT was fantastic. I can't put it down. I took some to the office for the girls who work for me, and they even begged for more. GREAT recipe, easy and very very good. I love it when the recipe is as good as the picture. I did add some raisins and cinnamon. Oh, and I love the extra vanilla sauce. PERFECTO. Oh, i didn't use the rum at all and it was great without it. This is very easy to make. Almost all the ingredients are already in my pantry. I have never made bread pudding. This was the first time. It is for my husband and his fire department crew. I will be dropping off tonight and let them be the official taste testers. I made this for my family and it was heavenly. I took some into my office and the girls just went nuts for it. This is the easiest and best bread pudding I have made so far. Thank you. I would also love to take this to work but the recipe says to pour the sauce over the "warm" cake. How did you store it overnight? Did it taste good cold or did you warm it up? Can you make this ahead and rewarm to serve? Delicious! Warm and comforting. My entire family loved it. Half the sauce is enough. Can I substitute 9 egg yolks with 5 whole eggs? Would that give similar results and hold the bread pudding together? AWESOME! I used a loaf of Brioche bread and cut the sauce in half as mentioned by others. When I told my husband I was going to make this, he said yuk, I hate bread pudding so take it to work. Well, long story short, most of it went to work and everyone loved it with and without the sauce. What little I left at home for me to eat was gone before I could eat it. My husband did try it and said 'WINNER'! I made this today for our fellowship hour after the church service! Delicious! Everyone enjoyed it. I forgot the salt in the bread pudding mixture, but had used salted butter. I did not have the rum extract so I used about a teaspoon of bourbon. The flavors of the sauce and the pudding were wonderful. There's hardly any left. One person told me she could just eat the sauce by itself. It was really good! Thanks for the great recipe. I made this a couple of times. First time by mistake I used egg whites and it was great. Everyone loved it. This time I used egg yolks and it looks uncooked. I've left it in the oven for an hour and no change. What could've gone wrong? Help! Made this tonight for my family. Cut the sauce in half and there was plenty. Also added a teaspoon of cinnamon to the milk mixture. My husband had seen a tres leches bread pudding with candied bacon, so I made some to put on top. Everyone loved it. Only thing I would do different next time is try to figure out a way to get more crispy parts. Those are everyone's favorite! Thanks for a great recipe. This looks so amazing. I was hooked on tres leches the very first time I went to Costa Rica. But now that I have to have gluten free I have to pass :( has anyone tried this with gluten free bread? And if so what brand worked? This was AMAZING! I made it as one of the desserts for a women's conference and it was gobbled up! I did use mini croissants (12 c. Torn up) and heavy cream instead of evaporated milk. Also cut the luscious vanilla cream in half and still had plenty. Thanks for posting. Totally delightful!